Automated external defibrillators, or AEDs, can save a person’s life after cardiac arrest. Medical imaging devices help doctors see the human body to diagnose and treat disease. Handheld tactical radios enable American troops to communicate in war zones. Weather detection instruments allow meteorologists to predict dangerous storms and tornadoes. All of these products are made possible with the help of IEC Electronics, an advanced manufacturing company based in Newark, New York. IEC has been headquartered in Newark for 46 years. The company’s latest expansion signals that the small village in Wayne County will be its home for many more years to come. IEC Electronics is building a $22 million state-of-the-art advanced technology center in Silver Hill Technology Park. Construction of the 150,000 square-foot facility is expected to be complete by early next year. In exchange for state and local incentives, the company committed to create up to 360 new jobs over five years. IEC manufactures electronic components for mission critical and life-saving products such as encrypted satellite communication systems for military use and diagnostic medical equipment. Its customers are leading companies in the medical device, industrial, and aerospace and defense industries, including General Electric, Baxter Healthcare, and Harris Corp.
“We are aligned with global companies who tend to be market leaders in their respective sectors, and look to IEC to manufacture their products in the United States,” said Jeff Schlarbaum, president and CEO of IEC Electronics. A year and a half ago, the company realized that its successful efforts to bring in new business would result in customer demand that would exceed the capacity of its current building on Norton Street. That building—a former paper factory—is also over 100 years old, and in need on ongoing upkeep and modernization. “With those two forces converging, we decided to embark on an expansion to house our headquarters and additional manufacturing operations,” said Schlarbaum. 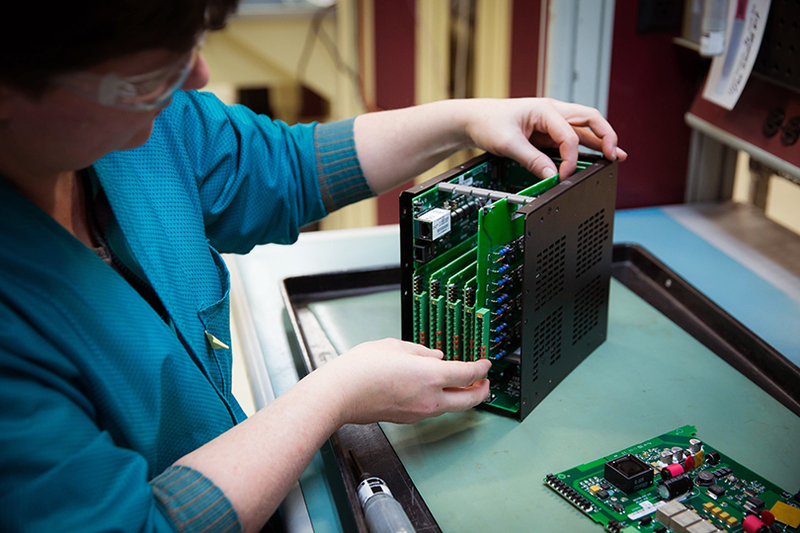 In the last 18 months, IEC Electronics has added 225 jobs to its workforce. Eighty percent of those new jobs created were in Newark. The company also has facilities in Rochester, New York and Albuquerque, New Mexico. “We’re growing at a rapid pace,” said Schlarbaum. IEC currently employs over 600 people in Newark, and over 800 company-wide. It is one of Wayne County’s largest and oldest employers. IEC Electronics was founded in Rochester, New York in 1966 as a manufacturer of electronic components for consumer products. It relocated to Newark in 1973. In the 1970s and ‘80s, the Newark facility supplied the electronic components for the first set-top boxes for Atari and Coleco video game systems. Then the market shifted, and consumer electronics manufacturing moved to China and Southeast Asia, where products could be manufactured at a lower cost. 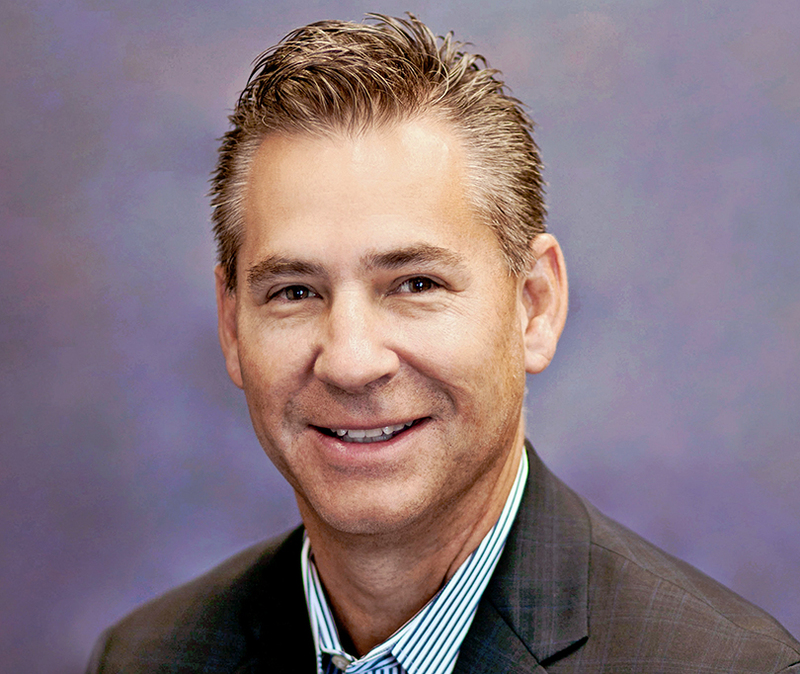 Jeff Schlarbaum, president and CEO of IEC Electronics. “Because of the shift in the landscape of electronics outsourcing, we had a decision to make on either moving to overseas geographies and following the low-cost strategy, or redefining ourselves,” Schlarbaum said. The company chose the latter, and that decision proved instrumental to its survival. After reaching an all-time low employment level of under 100 employees in 2004, IEC was re-engineered to focus on highly regulated markets that embraced domestic manufacturing. Those markets, Schlarbaum explained, have high barriers to entry, but once a company breaks in, it typically has staying power. Schlarbaum, who worked at IEC from 2004 to early 2013, was part of the management team that directed the company’s transformation. He was brought back to lead the company as CEO in 2015. IEC Electronics is a customer-first company. Within that factory are significant investments in advanced technology and precision equipment—including automation and robotics—that enable IEC to compete on a global stage. While many of its competitors have manufacturing facilities located around the world, IEC manufactures its products exclusively in the U.S.
“IEC has many of the global capabilities that these large multi-national companies possess,” he said. Schlarbaum describes the company as self-sufficient. It’s able to perform critical services for customers in-house, as opposed to relying on third-party suppliers. At its precision metalworking facility in Rochester, IEC fabricates enclosures for its components as well as other machined parts that are integrated into customers’ end products. 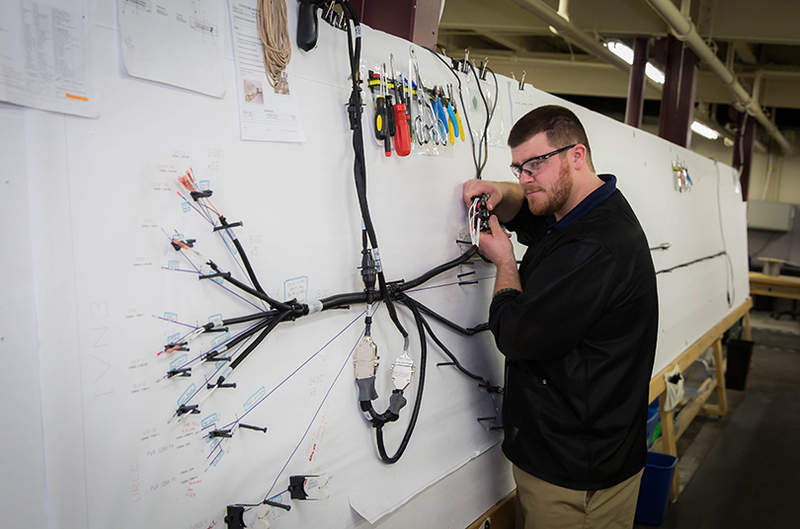 It also has an interconnect solutions division that produces wire harnesses and cabling that make up the final system. “In the past, we would have had to outsource that work, and today we can control our own destiny by performing that work in-house,” Schlarbaum said. To further differentiate itself, IEC developed a testing laboratory to authenticate electronic components. In cases where there is scarcity of supply, Schlarbaum explained, counterfeit or knock-off products are often introduced in the marketplace. Its lab provides customers with certainty that the components they are using in their products are legitimate. 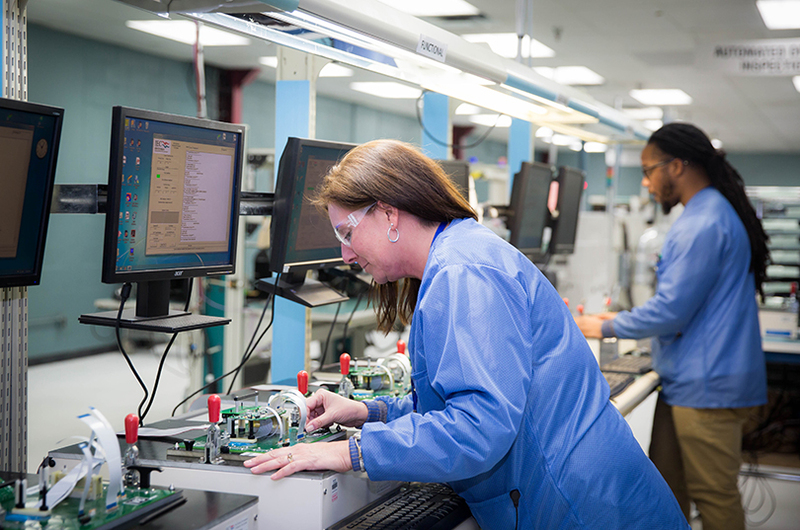 IEC is the only electronic manufacturing services company in the industry to be certified by the U.S. government’s Defense Logistics Agency to perform counterfeit component authentication. IEC supports the full life-cycle of its customers’ products. It not only designs and builds the electronic component, but can integrate it into the final device or system, test and distribute it to the end customer, and support all of the after-market services, including warranty repair and upgrades. “Our customers can look to IEC as a one-stop shop versus having to have multiple stages in their supply chain handling the various aspects of the manufacturing cycle,” Schlarbaum said. As a long-time employer in the region, IEC has spent years building the capabilities and relationships necessary to run a successful company. The knowledge base it has gained was an important factor in its decision to expand locally. Schlarbaum noted that several generations of area residents have been employed by IEC through the years, comprising a dedicated and talented workforce. The company wants to provide the same opportunities to future generations, he said. IEC also values its relationships with the region’s higher education institutions. 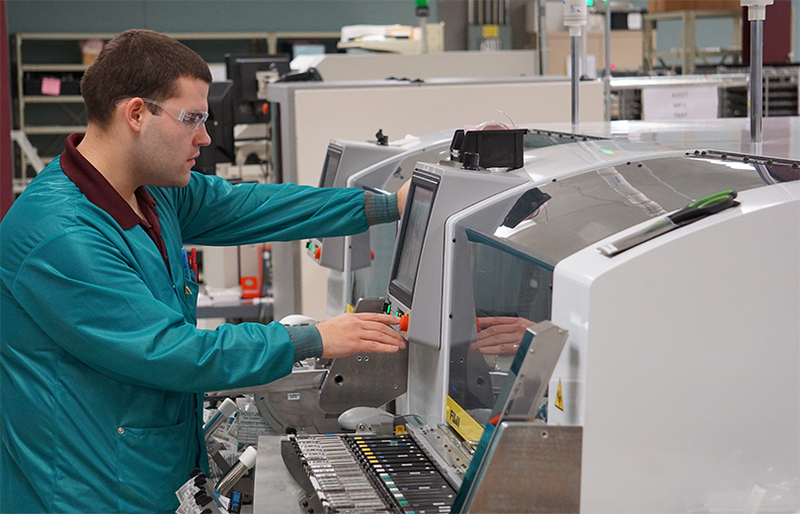 It works with Rochester Institute of Technology on co-op and internship programs to encourage students to pursue a career in advanced manufacturing, and provide local companies with skilled workers. When it moves to Silver Hill Technology Park, IEC will be neighbors with Finger Lakes Community College’s Wayne campus. “We look forward to forging an alliance with the FLCC campus to develop the technical and professional talent that will be required for our future growth,” Schlarbaum said. Silver Hill Technology Park is owned by Wayne Economic Development Corp., the economic development agency of Wayne County government. The business park is also home to another leading technology company, Ultralife Batteries. Schlarbaum credited the support of Wayne County, the village of Newark, and New York State in facilitating IEC’s expansion. IEC’s new facility is slated to open next year at Silver Hill Technology Park, 1000 Technology Parkway, Newark.